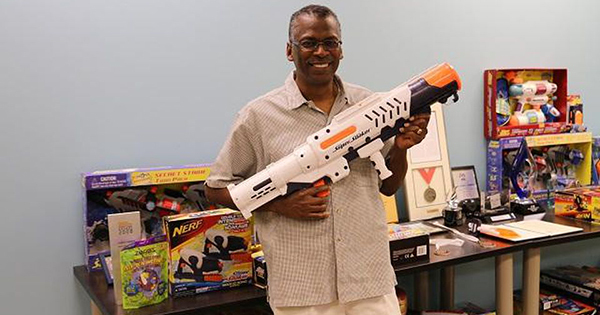 Meet the Genius Black Inventor Who Created the Super Soaker Back in 1990 -- And Holds More Than 80 Patents on Other Popular Products! Lonnie Johnson, from Mobile, Alabama, was working as an engineer for NASA when he accidentally created what led to the invention of the Super Soaker water gun. It was the year 1990, and his invention quickly became America's favorite toy and went on to generate more than $1 billion dollars in revenue. Now 68-years old, Lonnie recently told Forbes that he has been "tinkering around" with inventions all his life. Although he had absolutely no experience at all in the retail industry, he just knew that his super-powered water gun would be a great product for both children and adults alike. Lonnie says that one day while at work in a NASA laboratory, he was working on a heat pump that used water instead of Freon. He was experimenting with nozzles, and suddenly he was able to shoot a stream of water across the room. The vision came to him almost instantly! In 1989, he pitched the idea to some executives in the toy industry at the annual Toy Fair, and convinced them to develop the product and pay him royalties. And within just one year, the Super Soaker was in toy stores all across the country... and the rest is history! Most people don't know this, but Lonnie is also the guy who invented high performance Nerf dart guns. These also became wildly popular, leading to a lucrative licensing deal with Hasbro - the largest toy maker in the world. He reportedly made more than $70 million in royalties from this deal. In addition, Lonnie continues to run his own engineering firm called Johnson Research. Based in Atlanta, he and his 25 employees are currently developing two devices that he believes can revolutionize electrical power generation and storage. He currently holds over 80 patents, and has over 20 more pending on products and processes ranging from toys and consumer products to advanced technology energy devices and methods.